15c and city mark of Moulins ? It look like 15 carats mark and city mark of Moulins (1838 - 1887), but I don' t know, if France had carat hallmarks and I can' t find any standards mark (as shell or eagle). This item is a brooch with two small pearls. 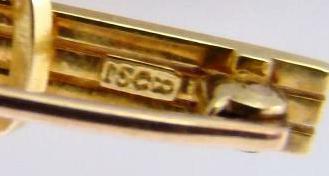 Thanks for any help in the identification of this hallmark.